Brian Kuhlman blasts out of a bunker during the 2016 championship match of the Lima City Men’s Golf Championship on his way to the first of his two consecutive city championships. 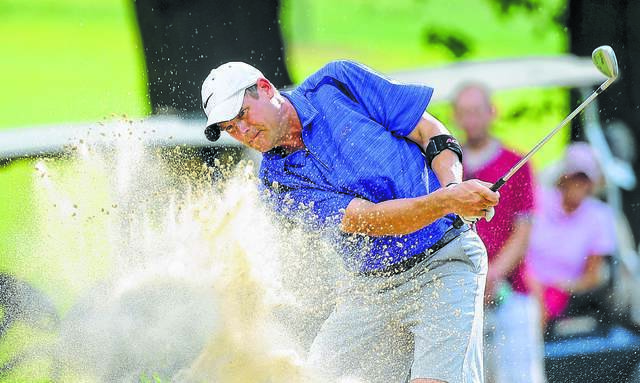 He has won the last two Lima City Men’s Golf Championship titles but Brian Kuhlman still did something connected with that tournament for the first time this year. Kuhlman joined the ranks of golfers who filled out their entry application online this year. Eighty-one of the 143 golfers in the field entered online this year. If Kuhlman adds a third consecutive city championship, he would join a select group of golfers who have done that in a tournament that began in 1925. Tim Crockett won four in a row in the early and mid-1980s and John Boose won the big trophy five years in a row from 1930-1934. The Ottawa golfer, who plays at Hidden Creek and Bluffton Golf Club, became the thirteenth golfer to win back-to-back city championships last year when he defeated Steve Creps Jr. 3-and-2 in last year’s title match. This year’s tournament tees off Wednesday for the Open flights and Senior flights with the Open golfers playing at Colonial Golfers Club and the Seniors going to Hidden Creek. On Thursday, the Championship flight will have a qualifying round in the morning at Hidden Creek and then start match play there in the afternoon. Open flight match play will begin at Springbrook and match play for the Senior flights will begin at Colonial. All flights will play at Bluffton on Friday and the Shawnee Country Club will be the site for all flights for the semifinals on Saturday and the finals on Sunday. “I’m not even thinking anything like that,” Kuhlman said when the subject of a three-peat was raised. “I’m just going to try to play my game and try to get a good seed and tackle the guy who’s in front of me. In these things you just try not to beat yourself. If someone goes out there and plays real good and beats you, then you give them a tip of the cap and you’re fine with that. You just don’t want to go out there and beat yourself. “You just know you’re going to be in for a grind. If you’re moving on, you keep moving on and deal with the next situation. I’m looking forward to it,” he said. The 13 golfers to win at least two city championships in a row are: Tom Foster (1941 and 1944, with no tournament in 1942 and 1943), Jim Stout (1945, 1946), Les Anderson (1947, 1948), Bill Leonard (1950, 1951), Brad Armour (1958, 1959), Greg Monroe (1967, 1968), Shim LaGoy (1969, 1970), Troy Wright (1987, 1988), John Moheyer (1998, 1999), Joe Whittaker (2008, 2009), Boose, Crockett and Kuhlman. https://www.limaohio.com/wp-content/uploads/sites/54/2018/06/web1_LimaCity1-1.jpgBrian Kuhlman blasts out of a bunker during the 2016 championship match of the Lima City Men’s Golf Championship on his way to the first of his two consecutive city championships.